Game Changer alert – controlling all your Christmas lights with just your voice! Sign me up! How annoying is it to go around your house everyday during the holiday season and turn all your Christmas trees on, then turn them all off? Then turn all your lighted garland on and off? Then turn all the other lighted decor in the house on and off? That is what I had been doing this season until my hubby ordered smart plugs. 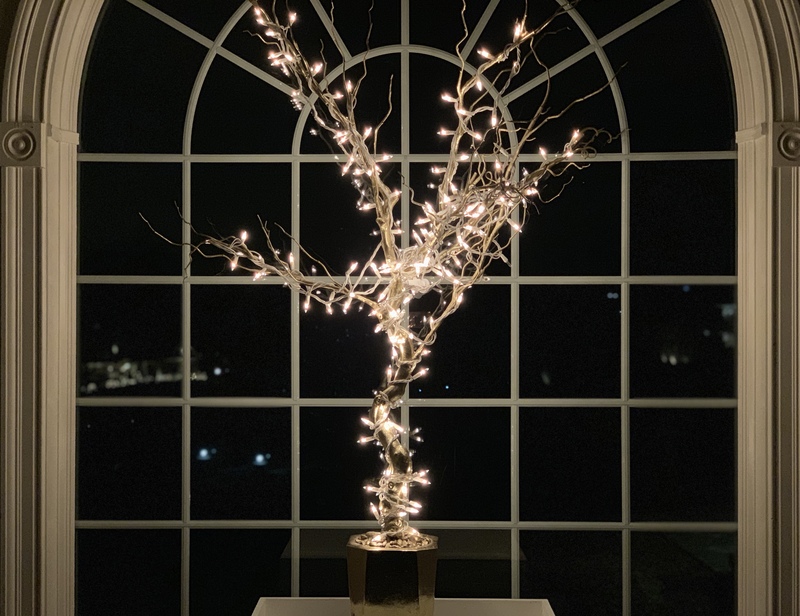 Granted, I probably have more trees and decor than most, five trees in total and many other lighted pieces so I was thrilled when my hubby showed me that I can control all the Christmas lights in the house with my voice! These smart plugs HERE are a game changer! They couldn’t be easier to use – plug them into an electrical outlet, insert your plug into it and connect it to your Wi-Fi. Three easy steps! You must download the WEMO app first but once you do, you can connect all the plugs to your Wi-Fi and control all of them with your phone. I took this one step further, I am controlling all my lighted decor using my voice. The WEMO plugs work with Amazon Alexa Speaker HERE, the Echo Dot HERE and Google Assistant HERE. Take a look at this short video I made using Alexa to turn my Christmas tree lights on and off. Make sure your volume is up. It’s that easy! We also purchased light dimmers HERE that work with the WEMO app and Alexa too. So we can turn all our Christmas decor on and the dimmed lights come on with the decor. How great is that? Another neat item I want to share with you is the Echo Dot for kids HERE. It plays music, answers questions, tells jokes and more. My son has the SPOT HERE, it has encouraged him to read more, he loves reading the headlines that appear each day and the alarm is super easy to set by voice. It gets him up each day and has a snooze. It tells jokes and plays lullabies..ok he’s a bit old for that but he loves playing music. I hope you found this post helpful…more tips, tricks and hacks coming your way. Subscribe to Happy Haute Home and don’t miss a post! Follow along on Pinterest HERE, and Twitter HERE and feel free to pin and tweet your favorite pics from Happy Haute Home. U R a Christmas Goddess! Hi Donna! You’re too sweet. Happy holidays!